Unspecified in Bible Text, I have set the tame in the mid afternoon. Strong sunlight from above right casts shadows to the left of objects, buildings and figures. From left to right: there is a group of four figures, all with their backs to the viewer, these are: an unnamed woman, the back of Jesus the Christ, an unnamed man in brown, and an unnamed man in green robes talking to Jesus (in blue robe). 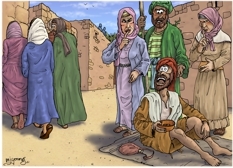 The second group of four figures on the right hand side of the scene are: Bartimaeus (son of Timaeus) sitting on the ground, shouting. Above and behind him there are two women (scowling & shushing Bartimaeus!) and a man. You may notice two small figures standing on a roof top in the background, and a lizard on the wall behind the group of figures on the right. I don’t often show the back of Jesus, but I wanted to show him having walked past Bartimaeus in this scene. Jesus is accompanied by a few people, although it is described as “a great crowd” in verse 46, but it wasn’t really necessary to draw lots of people just to make that point! Notice Bartimaeus is sitting on a blanket, with a wooden begging bowl in hand, with 2 small copper coins in it, and a water skin by his side.